Moore, 69, said the women's game "rides on the coat-tails" of the men - a view described as "sexist" by the United States Tennis Association (USTA). Women's world number one Serena Williams said Moore's statement was "offensive and very inaccurate". But her male counterpart, Novak Djokovic, claimed his tour should fight for more money. Moore said female players "should get down on their knees" in thanks to male counterparts such as Roger Federer and Rafael Nadal. The South African - a former player - later apologised for his "erroneous" remarks. 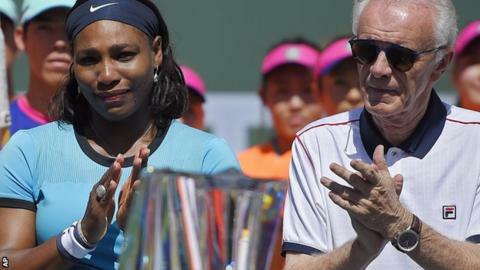 Tennis legend Martina Navratilova said Moore's comments were "extremely prejudiced", adding female players may boycott Indian Wells if Moore stayed. Djokovic, who won the BNP Paribas Open at Indian Wells on Sunday, described Moore's remarks as "not politically correct". But the 28-year-old Serb suggested men should get more prize money because more people watch their matches. There has been equal prize money in all four majors - the Australian Open, US Open, French Open and Wimbledon - since 2007, and combined Masters events such as Indian Wells and Miami pay the same to men and women. In a statement, Indian Wells tournament owner Larry Ellison said: "Ray let me know he has decided to step down from his roles as CEO and tournament director effective immediately. I fully understand his decision." Steve Simon, WTA CEO, said: "It is the right decision for him to step down. The BNP Paribas Open has supported the payment of equal prize money to all players since 2009." Speaking in a BBC Radio 5 live special on equality in sport, former badminton world champion Gail Emms said: "If was Novak Djokovic, I would feel aggrieved as well." The Briton, an Olympic silver medallist, added: "I don't like saying this, but it is easier to be a top female athlete than it is for males, because purely on numbers, how hard you've got to work to get up there. "I'm not saying the top female athletes don't work hard, and the ones at the top are fantastic athletes and sacrifice and dedicate a lot. It's just a numbers game." Djokovic said women had "fought for what they deserve and they got it", but claimed prize money should be "fairly distributed" based on "who attracts more attention, spectators and who sells more tickets". Navratilova said Djokovic "clearly doesn't understand" why men and women should get equal prize money in combined tournaments and she "thought we settled that issue years ago". Judy Murray, former Great Britain Fed Cup captain and mother of British number one Andy Murray, said: "I think there'll be a couple of people who probably woke up the next morning and wished they had thought a bit more about what they said before they said it." The United States Tennis Association (USTA) said player equality is a "bedrock" principle and there was no place for Moore's "antiquated, sexist or uninformed ideologies". Chris Kermode, chief executive of the ATP, said Moore's comments were "disparaging" and said they had been "made in poor taste". Former British Davis Cup captain David Lloyd backed Djokovic's view on the men's popularity, but said: "It's supply and demand and it could swing back in the future."